Florence Knoll passed away on Friday at the age of 101. Photo courtesy of Knoll. Florence Knoll, who passed away on Friday, was a brilliant architect who popularized modernism in America. Even 60 years later, shares Fast Company, her work has a contemporary sheen. OnOffice reports on the increased understanding of design’s impact on our health which has made wellbeing a central consideration for many designers. Marie Kondo, star of the new Netflix show “Tidying Up with Marie Kondo” and author of “The Life-Changing Magic of Tidying Up,” stops by Fast Company HQ in New York City to salvage a desk disaster. 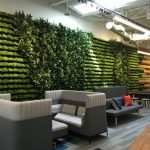 Ever wonder exactly how your office space impacts employee wellbeing? Forbes shares the facts. BizCommunity describes pro-working as co-working’s more mature older sibling, who is also better dressed and much more sophisticated.